Any paint product recommendations for an authentic colour match for the exhaust manifold, engine, ancillaries on my '69? VHT flameproof flat orange (GSP114) exhaust paint doesn't seem to be a great colour match- colour match for earlier cars? 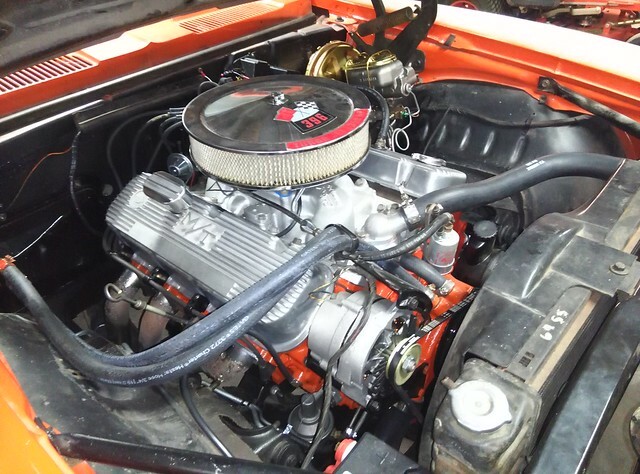 For engine I use Rustoleum 248941 Chevy Orange. 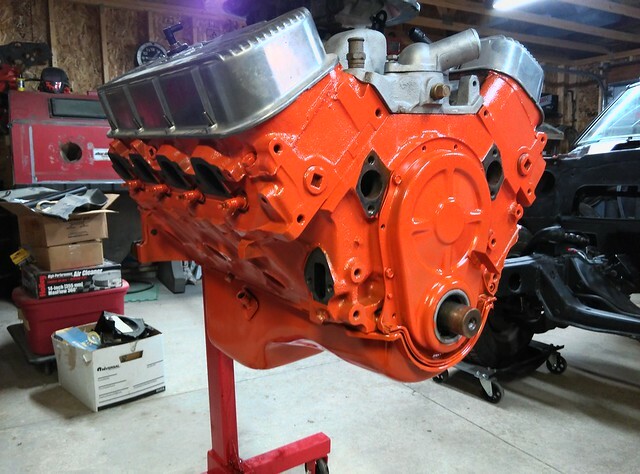 Here is what I did to mix up my version of VHT Chevy Orange to hold up to exhaust manifold heat. This was done on a totally clean manifold that was sand blasted and had a few light coats of VHT raw cast iron paint applied prior (but not cured yet). Get a can of VHT SP108 yellow and SP109 red paint. 1- Turn the cans upside down and support to as not to fall over and place a weight (I used a red brick) on top so as to keep the valve depressed until all the propellant completely gone. Very important to make sure the propellant is gone. 2- Use a can opener and slowly pierce the can to allow any residual pressure out (there should be none). 3- Pour paint contents into a solvent suitable mixing cup, one for red and one for yellow. You may see it bubble slightly due to some out-gassing so don't put a tight lid on the container yet. If the lid is tight it may pop off (personal experience). 4- With a separate empty mixing cup begin to mix the red and yellow to get the desired orange. Ensure the cups of red and yellow paint are kept mixed. Keep in mind this will be a flat finish but can be hit with a few light coats of VHT clear. 5- With a spray gun (You can use a cheap Harbor Freight touch-up gun) and following the directions on the can, spray light coats until you get the coverage desired. Apply VHT clear afterwards when it can be applied per directions. The most important part.......follow the curing directions exactly as stated on the can. I've been down the road with engine enamel on manifolds and it does turn darker and flatter once heated by exhaust temps. The VHT may turn slightly darker but it definitely will not flake off if cured correctly. Attached is a picture of the manifolds after several hours of engine operation and the home made VHT orange shows no signs of coming off. Here's one of my motors with Seymour. Nicely done Mike and great tips.. I think I am ready for another round of photos!!! Great suggestion. I will purchase a can of red to mix with the unused VHT flameproof orange I have already have. As you can see VHT's flameproof orange appears to be a different shade to their engine enamel- which I have used. Cheers. I will note that original engine paint wasn't full gloss.